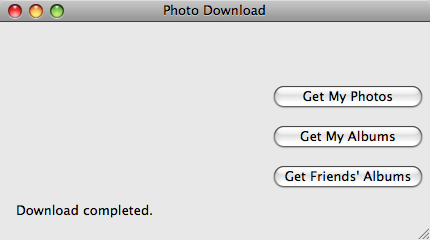 I have released version 0.0.2 of the Facebook application formerly known as Photo Exporter. You can download it from the Photo Download section of this website or visit its Facebook page. While the screenshot at the right looks similar to that of Photo Exporter, the application has several new features, including the ability to download your friends' albums. Unlike the previous version, v0.0.2 now lets you select which album you want to download, as opposed to trying to download all of them. If you notice any bugs, run into any issues using the application, or suggestions for improvement, please let me know by commenting here or sending me an email using the Contact page.